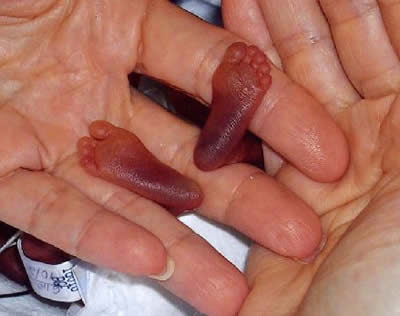 World's Smallest Baby : Amillia Taylor was born at 21 weeks and six days. No baby born at less than 23 weeks gestation had ever survived, but 10 ounce Amillia was able to pull through (and even was trying to breath and cry on her own at birth). Hospitals had initially hoped to release her yesterday, but decided to keep the now healthy baby a few extra days for observation. 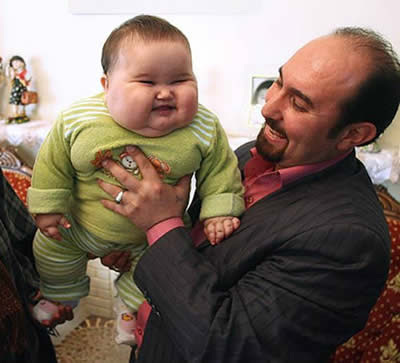 44 pound Baby : This baby born in Iran six months ago, currently weighs an enormous 20 kilos (44 pounds)! The parents say the baby was born a normal weight close to 8 pounds when he was born, but he keeps eating every hour. The Iranian doctors do not know what this eating disorder is or where it came from. 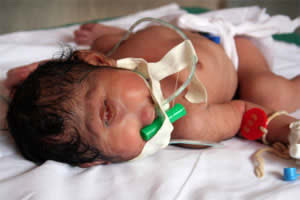 Cyclop Baby : This baby was born with a only one eye in India. Medical staff who helped deliver the child believe that the child's condition was caused by an experimental anti-cancer drug. Another cause written in the report by the hospital was that it could also be the result of a chromosomal disorder. The child was diagnosed with a rare chromosomal disorder, known as cyclopia. She was born with a single eye in the center of her forehead, no nose and her brain fused into a single hemisphere. With such severe deformities, it was a miracle that the girl survived even a few minutes after delivery. The baby died days later. Frog-like Baby : this bizarre-looking baby was born in Charikot, the headquarters of Dolakha district, attracting a huge number of onlookers to witness the astonishing sight. The baby weighed 2kg at birth and was born after the normal nine-month gestation period. Suntali, already a mother of two normal daughters, was not suffering from any illness during the pregnancy. Nir Bahadur, the father, says he does not feel any remorse for the newly-born baby's death. "I am happy that nothing happened to my wife," he said. Note : The baby has a condition called anencephaly, a neural tube defect (like the cyclops baby), with no proper brain formation. The baby would have died a few days later. That's why women are advised to take folate in early pregnancy. 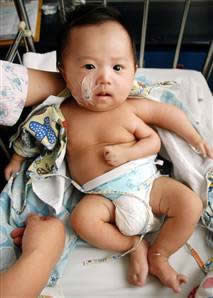 Baby with Three Arms : This 2-month-old baby named Liu Junjie from Anhui Province, China, was born with a third arm on 2006. Doctors successfully removed the extremely rare and well-developed third arm, but the baby required long-term physical therapy to gain function in his remaining hand, which has no palm and flexes in either direction. "We're hoping to exchange information with doctors who've dealt with similar cases anywhere in the world," said Chen, head of the orthopedics department at Shanghai Children's Medical Center. "This is so rare that we have virtually no information to go on. 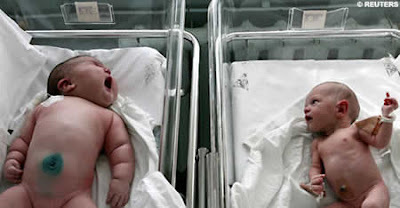 Born with 17 pounds : A Siberian woman who gave birth on 2007 to her 12th child was stunned to find that little Nadia weighed in at a massive 17.1 lb (7.75kg). "We were all simply in shock," said Nadia's mother, Tatyana Barabanova, 43. "What did the father say? He couldn't say a thing - he just stood there blinking." "I ate everything, we don't have the money for special foods so I just ate potatoes, noodles and tomatoes," she told the reporter, adding that all her previous babies had weighed more than 5 kg.